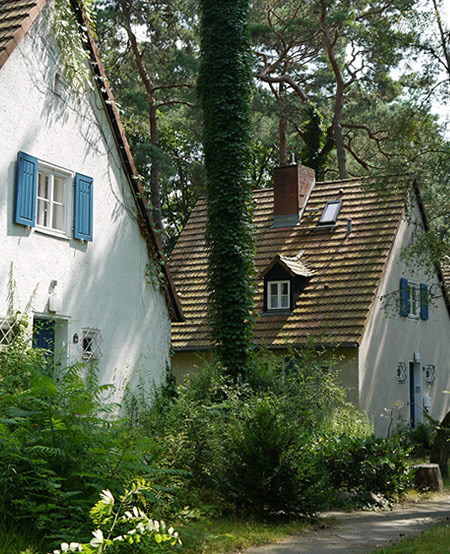 Nestled under tall pines where the Grunewald forest meets the streets of southwestern Berlin, you'll find the Waldsiedlung Krumme Lanke, an extensive residential quarter of cute, country-style cottages. With their neat wooden shutters and gabled windows, the rows of near-identical dwellings evoke a quintessentially German image of rustic charm. Which is exactly the kind of look, in fact, you'd expect for an estate built exclusively for members of the Nazi SS. 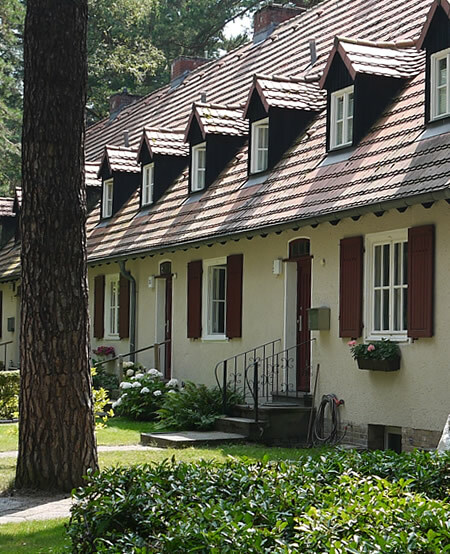 The project was initiated by Heinrich Himmler himself, who, in 1937, expressed his desire to create a residential quarter providing "satisfactory and healthy housing particularly suited to the raising of (SS) families". Work began the same year, and was completed in 1939. Unsurprisingly, the entire undertaking was heavily imbued with Nazi ideology. A competition was held to find suitable names for the new streets, with winners including Führerplatz, Siegstraße (Victory street) and Dienstweg (Duty Way). Likewise, the emphatically 'traditional' architecture was a conspicuous rejection of the 'un-German' modernist design which had previously dominated the construction of Berlin's Weimar-era estates (see 'Further Facts', below). Today, most of the streets have long since been renamed and the quarter is a favoured residential district. Apart from a single plaque on the estate's peripheries, there's little mention of its past. 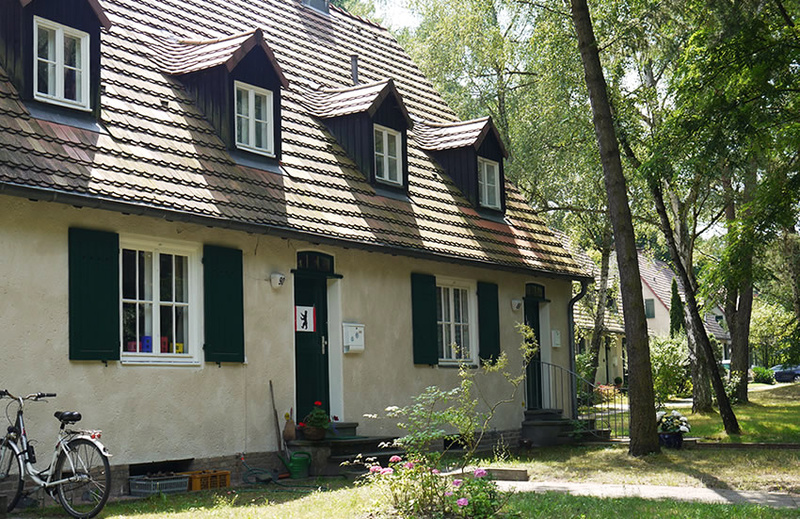 Understandable, perhaps, yet in many ways this quaint domestic paradise provides one of Berlin's most tangible insights into the Nazi vision of an utterly German Germany. And wandering through the enclave of woodland cottages, it's impossible to forget that it was once far less idyllic than it now seems. 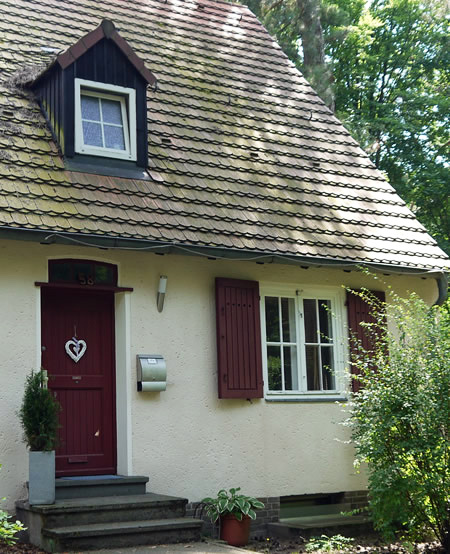 Just a short distance from the former SS residential quarter lies another large woodland estate - the Waldsiedlung Zehlendorf, (often referred to as Onkel Toms Hütte due to its proximity to the Metro station of the same name). Constructed between 1926 and 1932 by architects Bruno Taut, Hugo Häring und Otto Rudolf Salvisberg, the modernist enclave is an emblematic, yet surprisingly little-known, example of Bauhaus design in Berlin. Its functional, flat-roofed dwellings represented exactly the kind of design loathed by the National Socialists, and although barely a decade separates the construction of the two estates, the marked differences in their appearance and conception provide a powerful insight into the extreme political shifts of the time. Former SS Housing estate, now Waldsiedlung Krumme Lanke: 14163 Berlin. The estate lies between Argentinischer Allee and Quermattenweg, bounded by Ithweg and Wasserkäfersteig. Am Wieselbau, Am Fuchspass, Treibjagdweg, Hochwildpfad.